On May Day, the day of the international workers� movement, MAC members will be attending the 8 hour monument at 12 midday (cnr Victoria & Lygon Sts, opposite Trades Hall), along with members of the Anarcho-Syndicalist Federation, and more. Bring along your red and black flags! 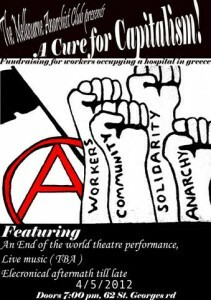 Featuring a performance by our resident theatre troupe, we will be raising money for medical supplies for a hospital in Kilkis, Greece that has been under workers' control since February 20. Come one, come all, it�s the perfect May Day fundraiser! The Workers' Solidarity Network have organised an action to show the fat cat bankers �You Can�t Haz Our Weekend� outside the Commonwealth Bank (cnr Bourke & Elizabeth Sts, CBD). For more details see the WSN website. Our reading group is up to Chapter VIII, Militant Minority: The Question of Anarchist Political Organisation of the book we are reading, Black Flame. As usual the reading is available online here.